Thank you for sending in your family heirloom mantel clock for an appraisal by mearto.com. I shall try to be of help in that regard. Stained hardwood (? 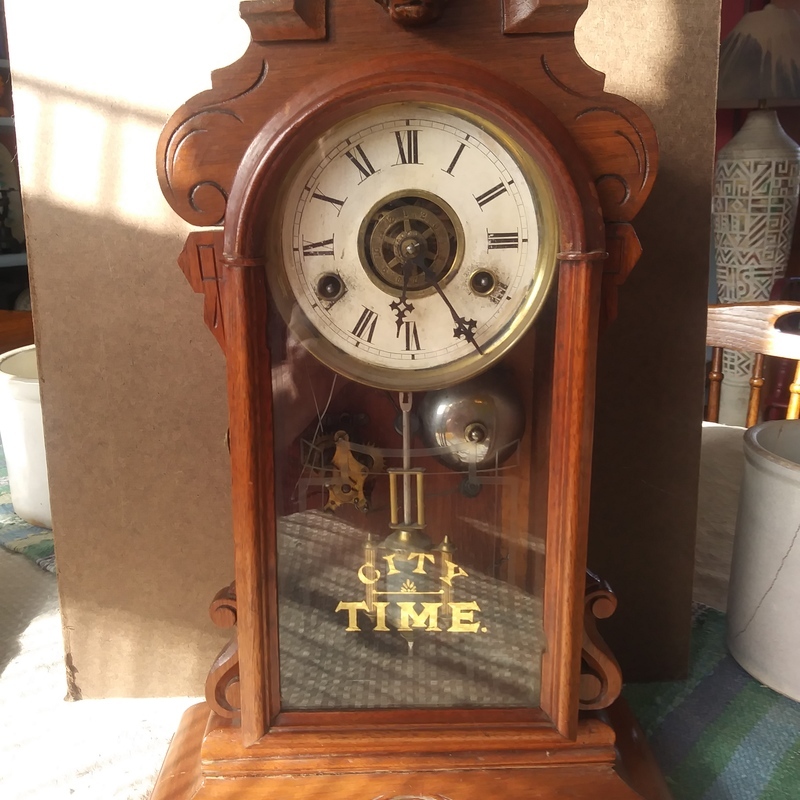 walnut), spring driven, eight day time, strike and alarm mantel clock in the ‘Gingerbread Eastlake’ style, Unsigned, most likely made in America by one of the Connecticut clock companies (made in the American style and perhaps altered in Europe), made circa 1880s. CASE – 18” x 14” x 5” stained hardwood mantel clock made in the era of the American gingerbread (1880-1900) clock in the Eastlake style (1836–1906). The pediment is a form of broken arch with concave molding, interrupted at the center with a three leaf design atop an applied lion head (in the style used by the New Haven Clock Company) carved from wood. The arched glazed dial door is surrounded near the upper end by Eastlake incised convex shaped foliate wooden patterns while just below the small side pieces become angular but retain the Eastlake patterns. At the lower end of the door the side pieces are more deeply carved in an ogival pattern, the carving different from that seen at the top. The arched glazed dial door has a rounded Gothic theme in the construction of the frame. A broad ogive shaped wooden base extends outward and is incised in the Art nouveau style with foliate designs. . . DIAL: A white dial, perhaps originally painted and then papered over (I cannot tell from the photo) and unsigned with Roman hours, closed minutes, machine stamped Victorian hands and two winding apertures. An aperture in the dial center has an alarm brass dial in the center. By rotating the alarm dial and placing the Arabic number of desired awakening under the hour hand and winding the alarm spring, it will start ringing at the desired time. (For instance in the phot of the dial the hour hand is just over the time of 7:30 on the alarm dial- so if you would the alarm spring the alarm would sound in a little over an hour from its current setting being close to 6:30.) . .
MOVEMENT - Not shown – Likely a skeletonized brass plate movement with two steel springs and anchor escapement, of eight day duration and striking a silvered bell on the half hour. A separate alarm spring is seen screwed to the lower backboard strikes the same bell when wound and the alarm set. A faux mercury pendulum bob in the New Haven Clock Company design swings in the lower case. . . CONDITION: - The dial is flaking and wearing in several areas especially around the edges and near the winding holes. The dial is unsigned. At one time there was a label on this clock either at the base of the inner backboard or on the back of the backboard. The movement will be considered functional. The carving on the lower case is different from the carvings at the top of the case, much deeper and this may have been altered. The New Haven Clock Company, back in the 1840 era was the first American clock manufacturer to export American clock to England and later to the Continent. German clockmakers in the circa 1900 years copied many American models. New Haven had models named The Theiss, the Arno, Moselle, Elbe and the Rhine (also very similar to this model) all made in the early 1980s. Unfortunately those clock were marked for the maker on the dial and the movement which apparently you do not find on your example. However, it still is a very nice well made slim line gingerbread mantel clock, likely dating the 1880s and therefore has some value in the marketplace, but not that much because of questions about its origin. (My own belief is that this is an American clock.) Take a look at the movement to see if it is marked. How it got to Europe I do not know, but we do know that thousands of American clocks were sold to European countries. Fair market value would be in the $125-$150 range. Retail prices would, of course be higher.